his event touched closer to home as one of our team members recently lost her mother in October 2012 to ovarian cancer. 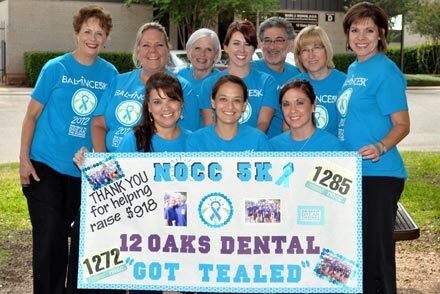 12 Oaks Dental was happy to contribute over $900 to help NOCC exceed their goal of $110,000.00 in the Austin area. The goal of this foundation is to raise awareness and promote education about ovarian cancer. The Coalition is committed to improving the survival rate and quality of life for women with ovarian cancer. We have partnered with the Capitol Area Dental Society to help local musicians. HAAM provides access to affordable health care for Austin’s low-income, uninsured working musicians, with a focus on prevention and wellness. Many Austin musicians are self-employed and have no access to health insurance or basic health care. They often work multiple jobs and struggle to pay for food, clothing and shelter, with nothing left for health care. These individuals face challenges such as long-neglected teeth. HAAM and its partners improve and save musicians’ health and lives and enhance Austin’s economy and quality of life. Austin is the Live Music Capital of the World, and we aim to keep it that way. We have been able to reach out and help several elderly individuals with permanent disabilities, live a higher quality of life.